We are living in times of daily world crises. One word too much, a selfish leader in the one or other country or wanton greeds. We can see it everyday in the news. The famous red button... And what would the world be afterwards? 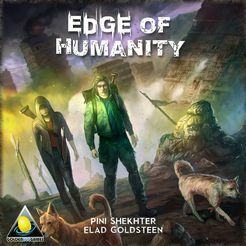 That's the question that Pini Shekhter and Elad Goldsteen try to answer in the new game Edge of Humanity from GOLDEN EGG GAMES. The scenario is a dark one: only few people did survive the third world war, and without law and order, the new world is a world of conflicts. Wasteland sends its regards. So the only aim of each individual is to survive. But there are still some men and women who try to re-establish a kind of normal life. That's us or better each player, as she or he leads a group of like-minded persons, gathers supplies, rescues more survivors and constructs new building. As a result, each player creates her or his own new place worthy to live in. 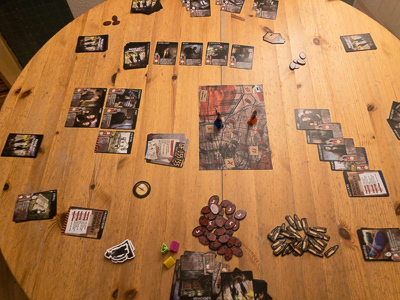 Although Edge of Humanity is a typical deck-building game, it is strongly story driven. Three pre-constructed sets of cards lead us through the unique events that unfold the story. The first deck tells us how the world become as it is now, in the game. 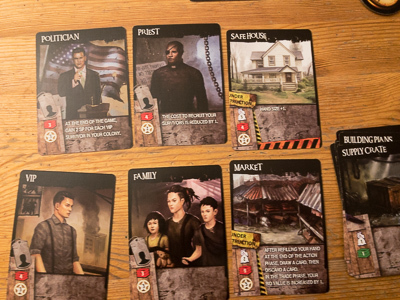 The second deck treats the nuclear aftermath, changing the people to aggressive monsters, and finally, in the third scenario pack, we are confronted with an alien invasion. And with the topic, the gameplay changes too: While we are still mainly involved in building houses and gathering supplies in the first scenario, weapons and attacking actions become more and more important in the two other scenarios. Every round a new event is drawn from the story pile that tells us more about the background story. Moreover, it defines special rules for the current round, which are more or less results of the new story elements. Although some effects doesn't really seem to fit to the story, the variations develop a strong sense of atmosphere, and let the players physically feel the new situations in the story. Often the players have to make decisions to encounter the result of a story card. Once all cards of the event deck have been revealed, the game ends. But of course the story cards, are only one side of the coin. Next to the event deck, as in every other deck-building game, each player gets his own deck of cards, which can be expanded during the game. Each player begins the game with the same 10 cards from which five cards are taken as hand cards, while the other five cards form the personal draw pile. New cards can be aquired in the trade phase. In a type of bidding round, each player bids a number of cards to be the first player to choose from the current offer. 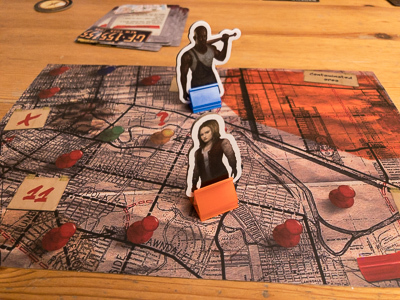 Unlike most other deck building games, Edge of Humanity does not use a constant market place. In contrast, you can find an offer of different trading piles (always one more pile than the number of players). These piles are built up by two new randomly drawn cards each new round again, but if one of the piles was not chosen by a player, it remains there and a new card is added for the next round. So a pile of no interest become more and more valuable, until a player takes it and a new pile is drawn. Players who do not take part in the bidding, are not allowed to take a pile. This option does not really seem to make sense, but you must know, that all cards used for the bidding are scrapped, so there might be situations in which a player wants to keep all of his or her cards. That is even more important, because the new cards are only placed on the discard pile, and players do not refill their hand after the bidding phase. As a result, you will end up with only few options for the next round, if you have bidden too many cards in the round before. 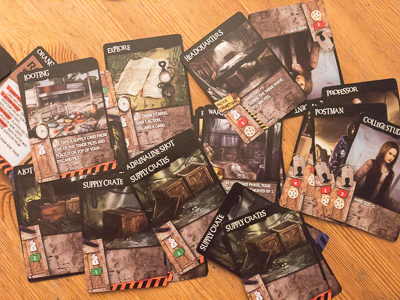 Next to the building cards, the other possibility to gain victory points is to recruit survivors. You can acquire these survivor cards from an outlay whenever your drawing pile is empty and you have to reshuffle your deck. After that you have the survivor in your deck, but you still have to to activate it to play it on the table next to the buildings. This is done in the last phase of the round, the recruit phase. Again, to play a survivor card you have to hold it in your hand and you have to �pay� it with supplies (that also must be in your hand).